← Chief Lake Lodge on Chippewa Flowage is Open! Yesterday we went on a long hike through the woods. It turned out to be a more taxing hike than I ever imagined…. I consider myself a fairly healthy person; I can manage at least a few years at a time avoiding most colds and illnesses. The big break in my hardy streak was this past fall. My body betrayed me and sucked in even the most elusive cold/flu germs. I suffered through two dreadful upper respiratory illnesses, both leaving me weak, tired and congested for weeks after. Sandwiched in-between, as if I needed another wallop, was a nice intestinal disturbance which caused me intense misery over a 3 day spread. But the absolute worst was when I pulled a hip flexor, an injury which endured the entire span of my illnesses. There is a series of muscles that run from your backside and through your groin area and then attach to the front of your thigh. These devilish little muscles control everyday movements we all take for granted such as bending over at the waist and lifting your leg or knee. A mild hip flexor pull can cause some pain and reduced movement, and a severe injury or tear can immobilize you for a few months or more. My injury fell somewhere well beyond the half-way mark of these two extremes – almost every move I made resulted in sudden, intense pain. Driving was a particular challenge as I had to ‘pick up’ my own leg and set it in the car before the rest of me could get in. Putting on socks and shoes was torturous and took a good half hour to carry out; the pain left me sweating, out of breath and spent. Why couldn’t it be sandal weather? Even as I passed the expected 8-week recovery mark, my mobility was still not up to par and certain movements freshly re-lit the memory of the intense pain. Needless to say, this injury, along with my illnesses put a damper on my normal winter activities – I hadn’t even attempted snowshoeing or hiking yet this winter. Despite all this I only missed a handful of days through the entire bow hunting season – I slowly waddled my way through the woods to my tree stand every day, rewarded by the long rest once I made it up the tree. Finally, here is it January and I simply must get back into my outdoor activities before this idleness becomes a habit. Yesterday was the first day in weeks that saw temperatures just above zero so it seemed a perfect day for a short walk through the rolling wooded hills of our land in Hayward. I was quite excited by it all – it was a beautiful sunny day despite the cold, and Dolly, anticipating the walk, could barely control herself during the car ride to the land. Last week, our neighbor had given us his permission to walk his 80-acre parcel north of our land so we planned on making a short loop on one of his old logging roads. Greg, Dolly and I started out strong, past the tree stand and up the first hill we went. Dolly was leaping through the snow and racing up and down the deer trails, grabbing twigs along the way. The afternoon woods were very quiet, not an animal in sight anywhere, just endless bare trees and snow-covered hills. The canopy of tree branches, even though lacking leaves, still managed to keep the sunlight from melting snow on the forest floor so we found ourselves surging though pretty deep snow. The climb over the first few hills was exhilarating and the much-needed exercise felt great. I welcomed each deep breath of the crisp winter air as my muscles warmed up with the exertion. Finally! I am alive again! As the afternoon sun slid closer to the horizon we found ourselves on an unfamiliar trail deep in the woods. Greg ventured off to investigate an area of deep ravines while Dolly and I forged ahead through the woods. Our neighbor’s land has an intricate trail system throughout, and of course we are not familiar with it. Dolly and I stayed on the trails that veered left so we could stay parallel to the route we thought Greg took. After what seemed to be a long time alone in the barren woods, Dolly and I were relieved to spot Greg and we all met up on the trail. By now, I was beginning to feel the first twinges of ‘maybe I’ve overdone it for the first time out in the woods’ and told Greg we should start heading back. Besides, the sun was getting lower, and we could see the ominous red and orange backdrop spreading low behind the trees. Simply turning around and going back on the same trail we came on was an absurd idea to Greg. After all, he “knows everything about the Northwoods”, so why would I want to argue about his choice of paths back to the car? We set off, in what direction I have no clue since I didn’t have a compass with (big mistake). What seemed like a long time later, I mentioned that I hope we are almost back because my leg is getting pretty sore. Greg tried to act like he knew where he was but I am sure he had no clue. I think even Dolly wondered – she too was beginning to feel the effects of overexertion- she was not cavorting through the snow like a puppy, any longer! We were deep in the forest, with no end in sight. I strained to find any trees or landmarks that looked familiar, without success, and I couldn’t even tell what direction we were going because the rapidly dimming red horizon was all around us now. I had a few minutes of panic until I realized that we would eventually reach a road no matter which direction we marched. By now I was struggling. Each hill we climbed was like Mount Everest; my breathing became labored and my tired muscles fought every step through the deep snow. I was downright fuming – if we had simply turned around and went back the way we came, like I wanted to do, I’d be back at the cabin by now, relaxing with a cup of hot chocolate. But, no, that would just be too easy! Alas! We can see the faint outline of a house through the trees-it has to be our neighbor’s cabin so I know we are close. Up over the next hill I spotted the welcoming sight of my tree stand, finally something familiar! Of course, Greg now acted as though the route we took had been entirely planned and he dismissed my vile comments as we rambled down the hill on our homeward stretch to the car. Back at the cabin I pondered the afternoon’s hike. Next time I will be bringing a compass for sure, no more guessing, and of course, if I find myself in this situation again, I am going to rely on my own instincts. Dolly and I are both wiped out by the long walk and she doesn’t even raise her head when I talk to her. We both sigh and just relax, the woods are awesome but there is nothing like the comfort of your own cabin. 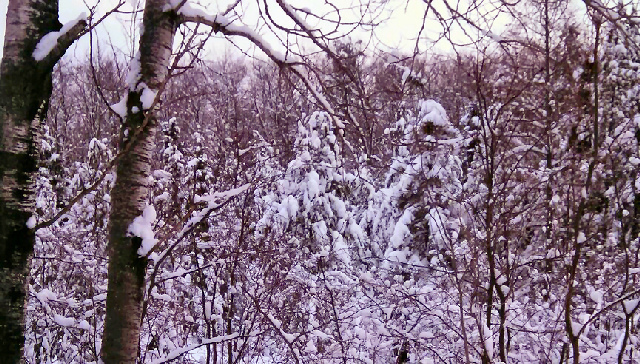 This entry was posted in NORTHWOODS LIFE, Scenic Observations and tagged compass, do i need a compass?, getting lost in woods, hayward wi forests, hayward winters, hiking in hayward wi. Bookmark the permalink.